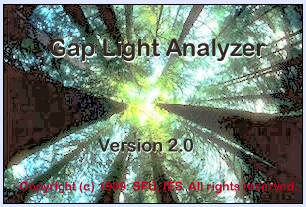 UPDATE on November 15, 2016: Gap Light Analyser became newly available also for 64-bit Windows machines; the installation files can be downloaded from the original GLA website. Thanks to David Wojtowicz of the University of Illinois for updating the original installer and sharing the news! As David mentions in the comment below, he became an unofficial maintainer of this update. On the last terrain excursion from geobotany, we were facing the problem with Gap Light Analyser – the freeware program for analysis of hemispherical photographs of tree canopy, taken by camera with fish-eye lens. It can’t be installed on 64-bit version of Windows 7, although there was no problem with 32-bit version. In the end one student had still an old 32-bit machine, so we managed to analyse the photographs, but I was wondering how to solve the problem for future. I wrote to Gordon Frazer, the author of GLA, for some hack about how to solve the situation, and he recommended to install Windows Virtual PC and with Windows XP, and run installation of GLA on it. I tried it, and seems to work fine, although it’s a bit heavy-weight, because the installation takes some time (it took me one hour to complete the whole process). You need to visit Microsoft website (http://www.microsoft.com/windows/virtual-pc/default.aspx), choose your system (suppose you have Windows 7 Professional, I haven’t tried for other versions) and download the installation packages for Virtual PC and Windows XP (for free if you have genuine Windows system, which needs to be checked online). Install it, following the instructions on the website, and finally you can run virtual PC and install GLA on it. It’s a bit slower than ordinary PC, but it works. Unfortunately it’s not an ‘easy’ solution in a sense that you can’t make this somewhere in the field without good connection to internet (the installation files are over 400 MB large). But seems like there is no other easy (and free) solution – I checked two other freeware programs for analysis of canopy images, namely hemIMAGE and Winphot*, but both has the same issue like GLA – they can’t run on 64-bit machine (at least I have not succeeded to install them). There is also commercial software (e.g., HemiView), but I didn’t purchase it, so I have no idea if it works (I guess it should). This entry was posted in technicalities on July 16, 2012 by David Zelený.